Separate AS and NAS level security mode command procedures are used. Keys stored inside eNBs shall never leave a secure environment within the eNB (except when done in accordance with this or other 3GPP specifications), and user plane data ciphering/deciphering shall take place inside the secure environment where the related keys are stored. Key material for the eNB keys is sent between the eNBs during ECM-CONNECTED intra-E-UTRAN mobility. The figure above depicts simplified key derivation. The MME invokes the AKA procedures by requesting authentication vectors to the HE (Home environment) if no unused EPS authentication vectors have been stored. The HE sends an authentication response back to the MME that contains a fresh authentication vector, including a base-key named KASME. Thus, as a result of an AKA run, the EPC and the UE share KASME. From KASME, the NAS keys, (and indirectly) KeNB keys and NH are derived. 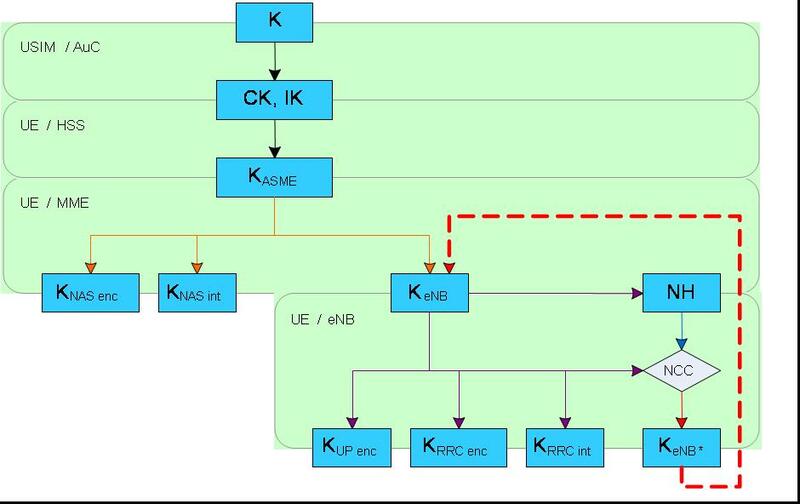 The KASME is never transported to an entity outside of the EPC, but KeNB and NH are transported to the eNB from the EPC when the UE transitions to ECM-CONNECTED. From the KeNB, the eNB and UE can derive the UP and RRC keys.